These are issues I have been thinking and talking about a lot lately – unfortunately for most of my readers here – in Danish. Hence, in this “Video blog” I argue the case for Open Borders quoting works by among other Michael Clemens and in this oped from the Danish business daily Børsen I argue that Danish government sponsored foreign aid should be cut in half and give mostly in the form of unconditional cash transfers to the people who are extremely poor. For half of the Danish government’s foreign aid budget you could give nearly 3 million people 1.25 US dollars a day and thereby ensure that they would get an income above the World Bank’s definition of “extremely poor”. What about bypassing governments and giving aid directly to the poor? Certainly, the immediate effects are likely to be better, especially in countries where little government-to-government aid actually reaches the poor. And it would take an astonishingly small sum of money – about 15 US cents a day from each adult in the rich world – to bring everyone up to at least the destitution line of a dollar a day. I hope that with Deaton’s well-deserved Nobel Prize some of his ideas will gain more influence on global policy debate over development, immigration and foreign aid. On my blog I mostly writes about monetary policy issues. However, I from time to time I venture into other areas. Among the areas I would like to give more attention to is the economics of immigration. I used to teach immigration economics at the University of Copenhagen and have done research on the topic while working at the Ministry of Economic Affairs in Denmark 15 years ago. However, I have not worked professionally with immigrations economics for well over a decade and I have only followed the new research in this area from a bit of a distance. However, since I started my blog I have had a tradition for inviting economic scholars and others to write guest posts on my blog. I am now continuing the tradition as I have invited Nathan Smith to write a guest post on a very interesting paper that he has been working on. Nathan in his paper is trying to give an assessment of the Global Economic Impact of Open Borders. His results are extremely interesting and in my view illustrates just how big the economic potential benefits are if we moved towards a world of free movement of labour across borders. This obvious is a very controversial topic so it is very welcomed that professional economists are contributing to a better understanding the topic. It is certainly about time that we start basing immigration policy around on a sound economic understanding of the topic rather than on emotions and populist rhetoric. I am therefore tremendously happy that Nathan has accepted my invitation to contribute to my blog on this very important topic. Nathan would like to use this opportunity to welcome comments on his ideas and his paper. I would very much suggest that everybody interested in Nathan’s work and the economic of immigration in general leave comments here at the blog or drop Nathan a mail (see e-mail address below). You are obviously also welcome to drop me a mail (lacsen@gmail.com). It would be great if we could make this an example on a ‘real-time peer review’ of an academic paper. First, a little about me. I’ve been an open borders advocate for nine years now, first publishing in an online journal call Tech Central Station (see here, here, here, here, here, here, here, here, and here), then in my 2010 book, Principles of a Free Society, and most recently at the blog Open Borders: The Case and The Freeman. My work experience includes the Cato Institute and the World Bank. My education includes a Masters in International Development from the Kennedy School of Government at Harvard (2003), and a PhD in economics from George Mason (2011). Now, I teach economics (macro, public finance, investments, international trade, research methods) at Fresno Pacific University, a small Christian college in California. The website Open Borders: The Case was founded by Vipul Naik and is dedicated to describing and developing the case for open borders in a rational and balanced way. Open borders is a question both of ethics and of positive economics. There are non-utilitarian arguments that deportation of illegal immigrants, exclusion of peaceful migrants, forcible separation of families, or other aspects of border enforcement violate human rights, are morally impermissible, and must cease regardless of the consequences. But even those who accept these arguments will be curious about what the consequences of doing our moral duty are likely to be. For utilitarians, the whole question will turn on what would happen under open borders. Others may accept that there are such things as rights, and that they may forbid some policies that would be adopted on the basis of a merely utilitarian calculus, but think that a substantial amount of migration restriction is consistent with rights. Open borders would then be evaluated on the basis of its consequences. So, putting my knowledge of development economics to work, I’ve just finished a draft of a paper, “The Global Economic Consequences of Open Borders,” in which I’ve been trying to guess what would happen if all migration restrictions were abolished. Lars was kind enough to offer me the chance to give a glimpse of my methods and results here. Under the status quo, markets for labor and human capital clear at the national level. Under open borders, they would clear at the global level. At any rate, that is how I model the main difference between the status quo and open borders. Everything else, initially, is either held constant—total factor productivity (TFP), country risk premia on investment capital, the total world population, the total world human capital stock—or changes because of the way global labor and human capital markets clear—the population and GDP of different countries, the global stock of physical capital, the wages of raw capital and the premium paid to human capital around the world. But before solving for a new global equilibrium in the labor and human capital markets, I had to develop a description of the world under the status quo. That is, I had to develop a stylized description of the current world economy, which was consistent with a theoretical model that could subsequently be solved for a new, open borders equilibrium, and which, at the same time, fit tolerably well with the data. At the heart of my description of the status quo are the factors of production. I follow Mankiw, Romer, and Weil (1992) in explaining international income differences primarily by differences in physical and human capital per worker. TFP still plays an indispensable role, but it varies across countries much less than does average human capital. It is indispensable because—as was pointed out by critics of Mankiw, Romer, and Weil (1992) such as Paul Romer—to explain international income differences entirely by international differences in physical and human capital per worker, requires one to claim that these differences are very large, with counter-factual implications for the marginal product, and therefore the price, of these factors of production across countries. As Lucas (1990) observed, if international income differences depended on physical capital alone, the marginal product and price of physical capital would be orders of magnitude higher in poor countries vis-à-vis rich ones, and if capital is internationally mobile, all new investment would occur in poor countries. If international income differences depended on human capital alone, then human capital ought to have a higher marginal product and earn more where it was scarce, and we should see mass emigration of smart college grads from the US to India, rather than the other way around. But fairly small differences in TFP—say, a factor of three between the most and least productive countries—suffices to reconcile a factor endowments explanation of most international income differences, with plausible factor prices. Table 1 shows, for selected countries: average human capital and the country risk premium on investment capital, as imputed on the basis of data; TFP, a residual used to reconcile GDP per capita with average human capital and the risk premium; and the “wage of raw labor” and “human capital premium,” as predicted when national labor and human capital markets are solved for equilibrium. 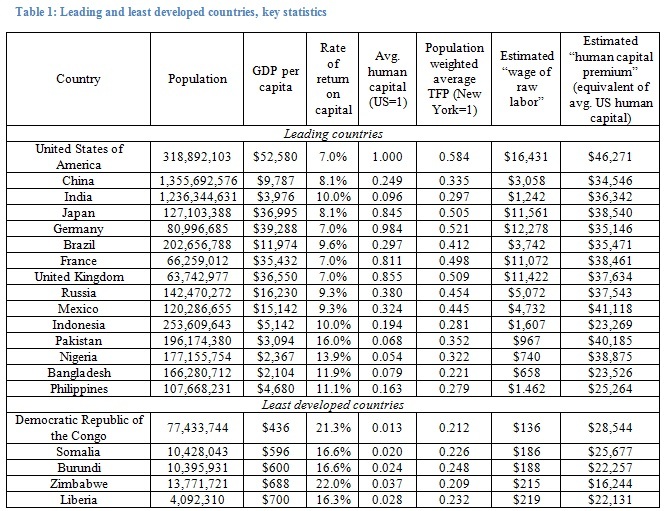 Table 1 features very large differences in average human capital across countries. Some of the world’s least developed countries have less than 5% of the human capital of the average American. Average human capital was imputed on the basis of the UN’s Human Development Index (HDI), but the HDI was interpreted as (linearly related to) the log of average human capital. A possibly surprising, but on reflection plausible, feature of the status quo world as described in Table 1 and the underlying model, is that the wages of raw labor differ enormously across countries, but the human capital premium, though it, too, tends to be positively correlated with human capital, differs much less. Lastly, it must be mentioned that there is a spatial model at work here. Working in Stata, I generate a data set of two million “settlements,” meant to fit major stylized facts about how the human population is distributed among cities, towns, and villages. I imputed TFP at the settlement level. I won’t try to describe the spatial model in detail here, but I do want to mention why it matters. A general problem for open borders models is that it’s hard to give strictly economic reasons why anyone would want to stay in unproductive places when they could move to productive ones. To address this question, I start by noting that some domestic locations seem more productive than others, and asking why some people live in, say, Elko, NV, instead of New York. My spatial model is based on (a) increasing returns, (b) congestion disutilities, and (c) differences in local TFP. So, Elko, NV has lower TFP than New York, and ends up with fewer people and less physical and human capital per worker, but people still live there for the cheap land and lack of congestion. By the same token, why would anyone stay in Mexico, Indonesia, or Malawi under open borders, when they could live in the USA? Because the best city sites in the USA will get congested, and some places in Mexico, Indonesia, and Malawi may be better than some places in the USA. So, what are my results? First, let me stress that these are preliminary. After some very helpful real-time peer review from my colleagues at Open Borders: The Case, I plan to refine the spatial model, and somehow I need to come up with better ways to deal with anomalies in imputed TFP, mostly arising from natural resource wealth. The paper describes two scenarios, “Scenario 1” which implements the model in the most literal fashion, and “Scenario 2,” in which I add in some other adjustments, such as human capital growth in response to the new incentives and opportunities of a world with open borders, falling country risk premia due to remittances and generally movements of people facilitating movements of money, and TFP adjustments due to cultural/institutional influences, positive and negative, and to the fact that TFP partly reflects congestible public goods. In Scenario 1, over 5 billion people migrate, and the world economy comes to be dominated by a few “Countries of Reinforced Dominance” and “New Settler Societies,” while the largest western European countries become “Corridor Countries,” which see much of their native human capital emigrate as they absorb a flood of less-skilled immigrants, and most developing countries become “Countries of Emigration,” losing much to most of their populations to emigration, or “Ghost Nations,” in which less than 2% of the native population stays. While I actually find these large patterns somewhat plausible, the “Countries of Reinforced Dominance” and “New Settler Societies” include too many resource-rich countries like Qatar, East Timor, and Botswana. Since everything else is mobile, high TFP outliers have an outsized impact on global outcomes. So, I’ll reserve judgment until I come up with a better way to get at “essential” GDP, reflecting the inherent productivity of a place’s institutions, deducting natural resource windfalls. For the record, unskilled workers’ living standards under Scenario 1 converge to 23% of the current US level; the human capital premium rises almost everywhere, converging to $66,535 per annum; average (but not necessarily median) incomes rise for natives of every country in the world; the global capital stock rises more than 100%; and world GDP rises by 80%. As I say, TFP anomalies are the Achilles heel of the model, and I like Scenario 2 better in part because it deals with them, albeit in a somewhat rough and ad hoc fashion. In Scenario 2, immigrants from low TFP places to high TFP places raise TFP in the places they come from, and reduce it in the places they go to. This is less about negative congestion externalities, which the spatial model has already tried to take into account, as it is about social norms and institutions. Take littering. Citizens of developed countries tend to have a “no littering” norm pretty firmly imprinted in their minds. Citizens of many developing countries do not. So, immigrants from developing countries would probably make litter more common in developed countries, since at least some of them would bring their bad habits with them. At the same time, the social disapproval and legal penalties they would face for littering in the West would change the habits of some of them, and return migration and letters home would facilitate the spread of a “no littering” norm back to migrants’ countries of origin. The same would apply to many other useful protocols and practices of developed countries, from tipping to not stealing napkins from food courts to not paying bribes to democratic tolerance to culturally valuing literacy and book learning, which open borders could be expected both to dilute at home, and to spread abroad. As it happens, these plausible assumptions about institutional transmission also tame the implausible ascent of high TFP outliers. Since “founder effects” are important, however, I give natives five times the weight of immigrants in determining the TFP, under open borders, of a country of (net) immigration, while emigrants have only one-fifth the weight of those who stay home, in determining the TFP, under open borders, of a country of (net) emigration. Scenario 2 represents, for the moment, represents my “best guess” of what a world of open borders would “really” look like. Even then, a strange qualifier must be added: I am holding things like world population and TFP constant even as I project the end-point of a transition that would take decades to play out, so the results must be interpreted as if the transition dynamics to open borders are “fast-forwarded” while other changes underway in the world economy are frozen in place. Total migration under Scenario 2 is a little over 3 billion, about 44% of mankind. Interestingly, international geographic mobility under open borders would look similar to interstate mobility in the USA today. The global human capital stock would rise by 50%, world GDP by 69%, and the global stock of physical capital by 88%. Most developed countries would turn into “host nations,” seeing immigrants from developing countries swell their populations, while most developing countries would see a large fraction of their populations emigrate. However, under Scenario 2, there would be no “ghost nations”: the worst-off countries would be “rescued” by the benign effects of their diasporas, and would see institutions improve, average human capital rise, and investment capital become more available. 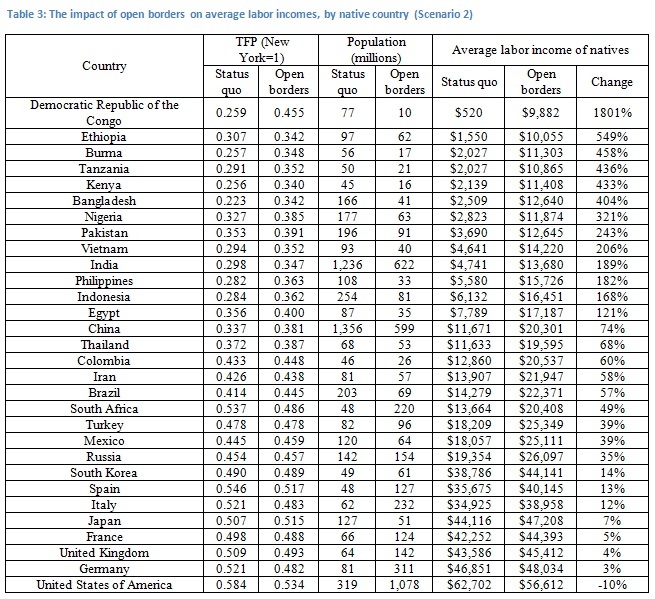 Some high TFP outliers would turn into “new settler societies,” but (setting to one side the special experience of the USA) these countries would end up with only about 10% of world population. The aggregate experiences of major geographic-cultural regions, shown in Table 2, give a pretty good description of how open borders would change the world under Scenario 2. The most striking feature of Table 2 is the dramatic rise of the West, defined as the EU plus the English-speaking USA, Canada, Australia, and New Zealand. The West’s population would soar to over 3 billion. It would be home to 43% of the world’s population, but about two-thirds of physical and human capital, and it would generate two-thirds of world GDP. Of course, the West might become less Western as it absorbed billions of immigrants, mostly from East and South Asia, so some might see this as, not the rise, but the end of the West. But polities that represent rival civilizations, such as India and China, would certainly see their relative power decline. More important, though, is the impact on individuals. And it is here that the strength of the case for open borders really shines through. “The Global Economic Impact of Open Borders” is meant as a contribution to positive, not normative economics. Evaluative judgments are included to keep the prose from being too dry, but are not what the paper is really about. Yet for anyone who cares about the welfare of the foreign-born, Table 3 cannot but be a powerful moral argument. For under Scenario 2, it is precisely the world’s poorest who would benefit most from open borders. Natives of the benighted Democratic Republic of the Congo would see their labor incomes rise, on average, by +1801%. Natives of Ethiopia, Burma, Tanzania, Kenya, and many other very poor countries, would see their incomes rise several-fold, partly because tens of millions of them would emigrate, partly because human and physical capital would become more abundant, partly because the diaspora’s influence would improve institutions. Natives of middle-income countries would see smaller, but still substantial, gains. Natives of developed countries would have a more ambiguous experience. There, the wage of raw labor would fall. The living standards of unskilled workers worldwide would converge to 44% of the US level. The human capital premium would rise in most places, even in the West, but in the USA, it would actually fall. This would occur because (a) the USA would be such a powerful magnet for skilled workers that average human capital, already high under the status quo, would actually rise slightly, and (b) TFP would fall by about 9%. In the large countries of Western Europe, natives would become minorities in the countries where they were born, but their average labor incomes would actually rise, thanks to gains from trade with immigrants, even as national TFP fell. But the median worker, having below average human capital, would probably earn less than under the status quo, and earnings would become more unequal. But the USA, where even the average worker would earn less than under the status quo, provides an especially good test case for the status quo. Whether Americans would really be worse off under Scenario 2 is tricky. Their labor incomes would fall, but those who own land—and most Americans are homeowners—would see its value rise more than three-fold. Also, the US government would enjoy a far larger tax base, which it might use to hold natives harmless in the midst of enormous changes. But if we think of open borders as a sacrifice by Americans for the benefit of the foreign-born, it has the merit of being enormously effective on a per dollar basis. Global open borders would reduce Americans’ labor incomes by 10%, while increasing by multiples the welfare of billions of the poorest among our fellow human beings around the world. While these results are not, in my view, rigged to favor open borders, they are of course highly contestable at the level of positive economics, as well as open, if accepted, to many normative appraisals. Yet I hope they will nonetheless help to dispel the notion that open borders are a “utopian” proposal. Open borders would not free mankind from work, or death, or turn the sea into lemonade, as one early utopian socialist dreamed. There would be major changes, and winners and losers, but on balance the changes would be positive, as well as highly egalitarian. Open borders is probably best compared to the abolition of slavery: a radical but not revolutionary reform, which seems quixotic, but which reason shows is attainable, and which will harm certain powerful vested interests, but benefit most of mankind, especially the worst-off, while expanding human freedom and reducing the amount of violence and coercion in the world. At any rate, that’s my best guess as to what would happen. But my results are preliminary, and I will be grateful for feedback and criticism. My blog is mostly about monetary policy matters. However, if I one day would stop writing about monetary policy I think there are two other topics I would focus on. The one is on the need to end the global war on drugs and the second is immigration reform. My view on immigration is pretty clear. Free trade is good – whether we talk about goods, capital or labour. It is that simple really. What is the optimal number of imported tomatoes? Soviet central planners tried to figure things out this way. Americans shouldn’t. We should decide on the optimal terms on which tomatoes can be imported, and then let the market decide the number. Similarly, we should debate what the optimal terms for immigration are – How will we let people immigrate? What kind of people? – so that the vast majority of such immigrants are a net benefit to the US. Then, let as many come as want to. On the right terms, the number will self-regulate. Econ 101: Figure out the price, set the rules of the game; don’t decide the quantity, or determine the outcome. When a society sets target quantities, or sets quotas, as the U.S. does now with immigration, the result is generally a calamitous waste. With an immigrant quota, an entrepreneur who could come to the U.S. and start a billion dollar business faces the same restriction as everyone else. The potential Albert Einstein or Sergey Brin has no way to signal just how much his contribution to our society would be. Immigrants would pay a bond at the border, say $5,000. If they run out of money, are convicted of a crime, don’t have health insurance, or whatever, the bond pays for their ticket home. Alternatively, the government could establish an asset and income test: immigrants must show $10,000 in assets and either a job within 6 months or visible business or asset income. You might fear that immigrants compete for jobs, and drive down American wages. Again, this is not demonstrably a serious problem. If labor does not move in, capital – factories and farms — moves out and wages go down anyway. Immigrants come to work in wide-open industries with lots of jobs, not those where there are few jobs and many workers. Thus, restrictions on immigration do little, in the long run of an open economy such as the US, to “protect” wages. To the extent wage-boosting immigration restrictions can work, the higher wages translate into higher prices to American consumers. The country as a whole – especially low-income consumers who tend to shop at Wal-Mart and benefit the most from low-priced goods – is not better off. And this is exactly why economists since the days of Adam Smith and David Ricardo have advocated free trade. And again – that goes for goods, capital and labour. If you are interested in the economics of immigration then I suggest you take a look at the Open Borders website. My favorite immigration economist is George Borjas – despite the fact that he has been advocating restricting immigration in the US. Read Borjas’ brilliant book Heaven’s Door together with Julian Simon’s The Economic Consequences of Immigration into the United States. Then you will be well-equipt to understand the main issues in immigration economics.